Agent 3 is the code name given to the player of Splatoon by Cap'n Cuttlefish in Octo Valley. The character returns as a supporting character and boss in the Octo Expansion. Credits art of a female Agent 3. Credits art of a male Agent 3. 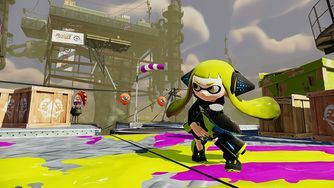 Agent 3 can have a variety of appearances, depending on the player's choice of gender, skin color, and eye color, as well as their current ink color. They wear the Hero Suit and can pick up armor to wear as well. They wield the Hero Shot by default but can use a Charger or Roller for amiibo challenges. Not much is known about Agent 3's background, except that they are at least 14 years old since they have complete control over their squid and humanoid forms. After following him through a manhole in Inkopolis Plaza, the player arrives in Octo Valley and meets Cap'n Cuttlefish outside his shack. He recruits the player as Agent 3, as part of the New Squidbeak Splatoon in order to steal back the Great Zapfish from the Octarians. He gives the agent the Hero Shot and a hand-me-down Hero Suit. The player goes through completing levels and defeating the Great Octoweapons. After defeating The Rampaging Octowhirl, Cap'n Cuttlefish gets kidnapped, and soon comes in contact with Agents 1 and 2. Agent 3 soon completes all the levels in Octo Valley and battles DJ Octavio. 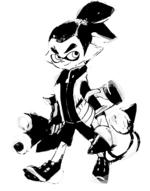 After the fourth phase, Agents 1 and 2 reveal themselves as Callie and Marie of the Squid Sisters, and play Calamari Inkantation, causing Cuttlefish to free himself. Agent 3 defeats Octavio and rescues Cap'n Cuttlefish and the Great Zapfish. The Great Zapfish is returned to Inkopolis Tower, restoring the city's power supply, while DJ Octavio is placed in a snow globe outside Cuttlefish's shack. Replaying the final battle shows a scenario where DJ Octavio has escaped from his snow globe and captured Cuttlefish again. In Splatoon 2, the role the player takes in single player has been replaced by Agent 4. Agent 3 is mentioned various times throughout the game through dialogue, and Sunken Scroll number 25 reveals Cap'n Cuttlefish went off travelling with Agent 3 for some kind of research trip "at the cape". Agent 3 returns in Splatoon 2's Octo Expansion. Agent 3 retains their original Hero Suit and Hero Shot, now also wearing a gray torn cape with a number "3" in Inkling which can be seen on other clothes like the Urchins Jersey. When Agent 8 collects three thangs, Cap'n Cuttlefish decides to make a "missing" poster for Agent 3, which has the player determine Agent 3's gender, skin color, and eye color. After Agent 8 collects all four of the thangs, the Telephone builds them into a blender and tricks Agent 8 and Cap'n Cuttlefish inside until Agent 3 bursts in from the ceiling and destroys the blender, responding to Cuttlefish's CQ-80 device's distress signal. Agent 3 is then rendered unconscious and Cap'n Cuttlefish stays behind to look after them as Agent 8 escapes through the hole Agent 3 made. The Telephone then attacks Agent 3 and partially sanitizes them. Under the control of the Telephone, they tie up Cap'n Cuttlefish and later on attack Agent 8 before they can leave. After being defeated, the sanitization disappears, leaving Agent 3 once again unconscious. They wake up after Agent 8 defeats the NILS Statue and Commander Tartar, now with a band-aid on the back of their head as the credits roll. When Agent 8 comes back to the Deepsea Metro, Cap'n Cuttlefish tells them that Agent 3 went back on patrol, explaining their absence. After Agent 8 completes all the tests, a locker in Central Station opens and Agent 8 has a flashback to the first time they heard the Calamari Inkantation, prompting a final battle against their "Inner Agent 3". The name Agent 3 was given by Cap'n Cuttlefish because Agent 1 and Agent 2 are Callie and Marie, respectively. Agent 3's real name is never revealed as it is initially dependent on the name of the player's system. Both Goggles and Rider act as Agent 3 in the Splatoon manga in Chapters 8 and 9, detailing Octo Valley. Both of them are Inkling boys wearing the full Hero Suit with the addition of wearing their the gear they are named after, being the Pilot Goggles and Black Inky Rider. They also use the Hero weapons from the same main weapon class as their usual weapons, with Goggles having the Hero Shot and Rider having the Hero Roller. In the Octo Expansion arc in Chapter 25, Rider mirrors the same role as Agent 3 in the game, where he rescues the Blue Team, Agent 8 and Cap'n Cuttlefish from the blender and later becomes mind controlled. He also has the cape Agent 3 wears in Octo Expansion, but uses his Gold Dynamo Roller instead of a Hero weapon. In the Splatoon Heartwarming Squids 4-Koma & Play Manga, Agent 3 is represented as a female Inkling who also is the main character, appearing with either green or orange ink. Agent 3 has been depicted as both genders in official artwork, female in the second Sunken Scroll in Splatoon 2 and the Octo Expansion trailer, whilst appearing as male in the official art for Splatoon 2's first anniversary. The Octo Expansion allows the player to customize Agent 3's eyes, skin tone, and gender using the same options available from Splatoon, to allow players of the original game a level of personal canon. In Super Smash Bros. Ultimate, one of the customization options for female Inklings is the ability to play as Agent 3, having a light skin tone and blue eyes, but still carrying the regular Splattershot and ink tank from Splatoon. Two sets of Gear identical to Agent 3's outfits can be unlocked for online play. After completing Octo Valley, the player is rewarded the Hero Headset Replica, Hero Jacket Replica, and Hero Runner Replicas. At Levels 25, 30, and 35, Judd will give the player the Armor Helmet Replica, Armor Jacket Replica, and Armor Boot Replicas, respectively. The Hero Headset Replica, Hero Jacket Replica, and Hero Runner Replicas are now rewarded by the Callie amiibo, and the Armor Helmet Replica, Armor Jacket Replica, and Armor Boot Replicas are now rewarded by the Marie amiibo. In the English translation of Splatoon 2, Marie remarks to Agent 4 that Agent 3 has fairly poor hygiene. Meanwhile in the Japanese version, Marie states that Agent 4 looks just as good as Agent 3. When unconscious after Agent 8 defeats them, Agent 8 can cover Agent 3 in ink, similar to Cap'n Cuttlefish in the first game. The ink covered on them will slowly go away. The options when "creating" Agent 3 are the same as the first game, the most notable example being the limited eye color choices. When Cap'n Cuttlefish draws Agent 3, he depicts female Agent 3 as right-handed, while the male as being left-handed, both holding the Hero Shot. However, when they make a physical appearance, both genders are right-handed. After defeating the Inner Agent 3, the player will receive the Golden Toothpick. It comes with the ability Special Charge Up, possibly referencing the fact that Agent 3 can get specials very quickly. The reason for why Agent 3 is able to use many special weapons is explained by Marina, saying that Agent 3 had removed their limiter, which implies that they can normally use many specials and have to use something that restricts this ability. Agent 3 possesses an employee model CQ-80. Agent 3 upon spawning in an Octo Valley mission. Official art of Agent 3 wearing the Hero Suit. Agent 3 meeting Cap'n Cuttlefish. Agent 3 patting a retrieved Zapfish doll at the end of a mission. Agent 3's whereabouts are briefly mentioned in Splatoon 2. Female Agent 3 as seen in Sunken Scroll 2. Male Agent 3 as seen in the art for Splatoon 2's first anniversary. Agent 3 with Agent 8, as shown in the reveal trailer. Agent 3 wearing a cape. The Inner Agent 3 from Agent 8's memory. This page has been accessed 256,410 times.